Let’s get it out-of-the-way; the plot of CAROUSEL is misogynistic, depressing, and disturbing. The story seems to endorse domestic violence. Billy Bigelow is not a good man; his wife Julie Jordan falls in love with him anyway, though, and essentially tells us (and their daughter) that its OK for someone to hit you because it doesn’t hurt if they love you. What?! That said, CCM’s production of this Rogers and Hammerstein classic is lavish, gorgeous, and professional. Director and choreographer Diane Lala takes us back to the Golden Age with the choreography; it’s a three-hour show with long dance breaks. I’m not usually a fan of shows of this length; the problem usually lies in the fact that they’re just not very good. In this case, though, it works just fine . . . because the show is maginficent. The story: Julie (Samantha Pollino) and her friend, Carrie (Casey Wenger-Schulman), take a ride on the town’s carousel. Barker Billy Bigelow (Ben Biggers) flirts with them, which enrages the owner of the carnival, Mrs. Mullin (Raven Thomas), who also has her eye on Billy. There’s Nettie (Brianna Barnes), Julie’s older, nurturing cousin. There’s Enoch Snow (Chris Collins-Pisano), Carrie’s “feller.” John Battagliese plays “Jigger,” an ex-con friend of Billy’s who convinces him to rob Mr. Bascobme (Alex Stone), ultimately leading to nasty consequences. The show was named Best Musical by the Drama Critics Circle in 1945. Richard Rogers wrote it was his favorite from their catalogue. Time Magazine called it the Best Musical of the 20th century. It’s a good choice for CCM – and this production is remarkable. In order for a story like this to work, the characters must be rich and textured. Pollino’s “Julie” is spunky but vulnerable. She’s strong but has a weakness and his name is Billy Bigelow. Billy is a jerk on the surface. But in the hands of Biggers – one of CCM’s finest actors – the character is multi-layered. The performances give insight as to why Julie would fall for him, which is important. Also, Pollino’s voice is exquisite and while she’s known for her dancing prowess (she’s choreographing AMERICAN IDIOT this spring) with this role she proves that she is a true triple threat. Biggers marvelous vocals and performance of “Soliloquy” is the highlight of Act One. That’s not to take away the work of Briana Barnes, who’s “June is Bustin’ Out All Over” shows why she is a future star. I’ve said it often – there’s just something magical about her. Stage presence, charisma, and those expressive eyes . . . I can’t wait to see where she goes next. I’ve watched Raven Thomas sing and dance since she was sixteen years old; what a treat to see her acting so well as Mrs. Mullin. This young lady has a bright future no matter what genre, style, or type of role she pursues. She brings subtle sass to her role and lights up the stage with the antique insults in the script. Because the show is nearly three hours, you need some comic relief. Chris Collins-Pisano injects life and energy into all of his scenes. As usual, he is a welcome presence on stage. So is Battagliese; his “Jigger” is creepy, troubling, and ultimately entertaining. Also, Tom Meglio, who is one of my favorite people to watch on stage, has a nice role at the end of Act Two. In spite of injuring his foot during rehearsals for BIG RIVER, he still appears here – crutches and all – and is as charming as ever. I’m a fan of all three of these young actors. Also notable is the fine work of Wenger-Schulman, Louis Griffin, Alex Stone, Hamilton Moore, Alec Cohen, Daniel Marhelko, Chris Kelley, Kyle Ivey, Tyler Jent, Kimberly Pine, Kyra Christopher, Paul Schwensen, Gary Cooper, Stavros Koumbaros, and the rest of the very strong ensemble. Areo Keller and Joel Flynn dance a glorious ballet number; I really enjoyed this. Lala’s style and influence is evident in this production (of course) and I will always do what I can to see her directorial work. The functional and unique set from Thomas Umfrid works very well. As always, the costumes – from Rebecca Senske, with wigs and makeup from Jillian Floyd – are as good as Broadway and student lighting designer Joe Beumer does a very nice job setting the tone for each scene. Roger Grodsky’s orchestra is luscious (he’s assisted by grad student, Danny White). Opening Night was not perfect; there was uncharacteristic sloppiness during a few of the large group dance numbers and several missed mic cues. I expect those will be corrected in subsequent performances. 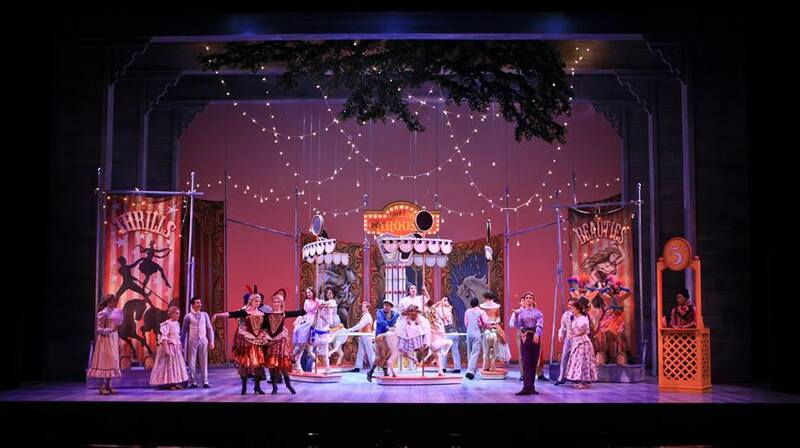 Despite these imperfections – and the infuriating storyline issues mentioned in the first paragraph of this review – CCM’s CAROUSEL is not to be missed. CAROUSEL runs through Sunday afternoon at the University of Cincinnati’s College-Consevatory of Music in Corbett Auditorium. Click here for tickets and more information.